Insect pollinators are declining due to habitat loss, pesticide use and other causes. Pollinator gardens are growing in popularity to help reverse this decline. Studies have shown these human-made gardens can provide much needed food and reproductive resources for the pollinators. But other studies show a darker side, where pollinators attracted to these gardens can be exposed to higher risks of predation, parasite infection and harmful chemicals. Gardeners must make decisions on everything from what species to plant, where to plant the garden, and how to manage weeds and pests. All of these choices can influence the abundance, diversity and survival of pollinator populations. But while there is a cornucopia of advice for creating pollinator gardens, much of that information lacks scientific evaluation. Researchers in the Odum School of Ecology at the University of Georgia conducted a review and meta-analysis, sifting through a multitude of studies to formulate a more focused approach to establishing healthy habitats for pollinators and determine where more information is needed. The paper, detailing their analysis, was published recently in Conservation Biology. Majewska said insect pollinators are responsible for much of human crop production so further decline would mean lower crop yields and fewer options for food. “This would directly impact the amount of fruits and veggies at the market,” she said. A decline would also threaten the viability of plant and wildlife communities, affecting the overall health of the ecosystem. “Most flowering plants, both cultivated and native species, are insect pollinated, and rely on insects for their reproduction,” Majewska explained. “These plants produce nectar, seeds, nuts and fruit, which in turn feed a plethora of wild animals.” In addition, she said pollinators are food for some wildlife. Birds and some insect predators feed on butterfly and moth caterpillars as prey. Results from their review and meta-analysis, which analyzed nearly 200 records from two dozen published studies, showed a wide variation in the relationship between the characteristics of a garden and insect pollinator populations. Characteristics included the presence of native or exotic plants, the location and size of the garden, and the use of chemicals. Pollinators consistently responded positively to gardens with a greater variety of plants. Woody vegetation, such as trees and shrubs, also benefits pollinators by providing additional food and shelter. But pollinators in garden sites separated from other natural habitats responded in a negative way. Pollinator communities benefited when gardens were closer to areas such as pastures that contain pollinators along with foraging and reproductive resources. Other factors produced mixed results. For example, native plants are often considered a better choice because exotic plants may not possess the look or smell needed to attract pollinators. Chemical use could have both positive and negative consequences on pollinator survival. For example, slug treatments and fungicides might improve the quality and health of treated plants, allowing for more investment in flowers that would attract more pollinators. But the direct effect of the chemicals on the pollinators could be detrimental. Too few studies on natural enemies (predators and disease) in pollinator gardens, and pollinator use of artificial or natural nest sites, meant that these factors could not be included in the analysis, and was proof that more work needs to be done. 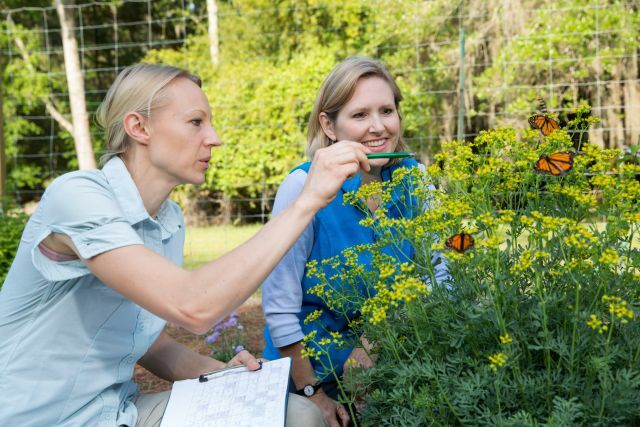 Because pollinator gardening is growing in popularity, Majewska feels scientists still have much to learn about how gardens compare to natural habitats for wild pollinators. “With our cities expanding and natural areas shrinking, we need more research on the effects of gardens on pollinator populations so that gardeners can employ the best practices possible,” she said.